You can create a plain text campaign without any HTML styling. 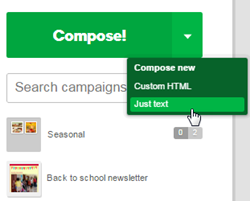 On the Campaigns page, click the down arrow to the right of the Compose button, and then click Just text. This opens the plain text editor so you can create a new campaign without HTML. Note: Since there isn't any HTML in your email, you can't include images, styling, or clickable links in your email. Additionally, you won't get statistics reporting on your mailing.